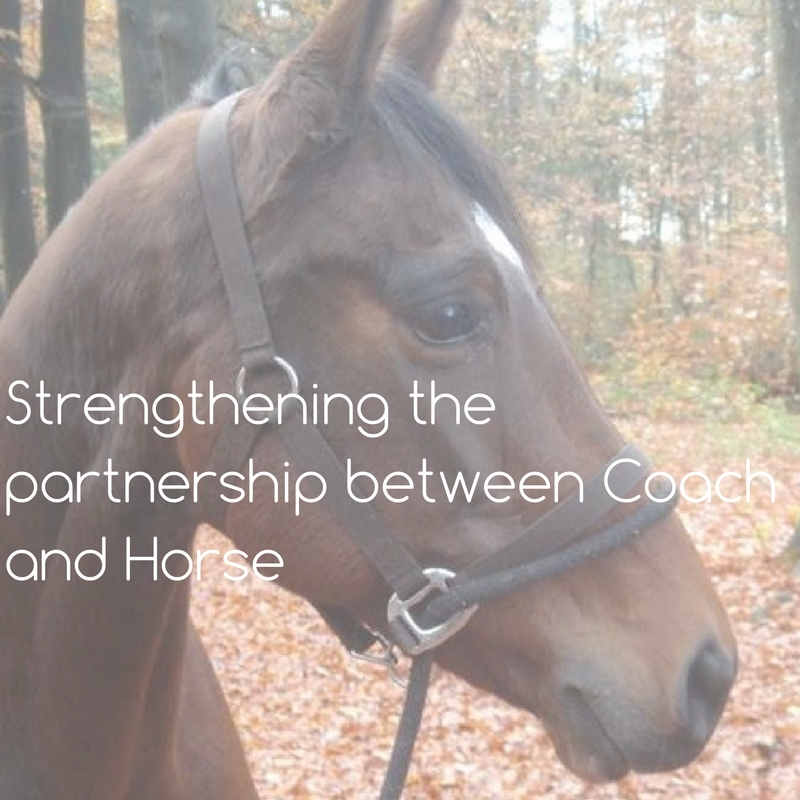 When I use my horse in an equine assisted coaching session (EAC) I need to be mindful of the partnership; the relationship between my client, myself, and my horse. My horse, Ulo, is by nature sensitive to emotions released in the session, after all that is the point of EAC. After a session, my client and I have a cup of tea and reflect on the session; while Ulo receives a treat of muesli in the stable before she is released into the field. But is that enough to help her release the energy she has absorbed from the session? My friend Nicola Mahon – owner of Breakthough Equi Coaching offered to show me techniques she uses to rebalance horses after her sessions. She has been training as a Tellington TTouch practitioner. I don’t know much about TTouch, but my understanding was that it is a technique which can be used on animals to enhance well-being as it helps to release blocks impacting their physical comfort, and therefore improving their behaviour. Maybe this sounds a little woo-woo, as some of my friends would say, but my feeling is that it is not a technique which will bring harm, so I was very open to it. Nicola arrived promptly, in fact I followed her from the main road, at the stables on Thursday – the coldest August day ever recorded. We brought Ulo in from the field and left her in the stable to dry off while we went into the canteen for a cup of tea and my introduction to the technique. We first talked about Ulo, what we do with her, how we have grown with her, what limits us. Nicola explained the different ways we can work with her, and she had brought sponges with her, so I could practice the TTouch movements, as well as various other tools, wands, wraps and pads. We decided after this discussion to simply practice different TTouch movements on her, as an introduction for me to be able to practice the same movements on my own. Ulo was now warm and dry in the stable, and we just went in with her and began. Nicola first worked her hands over her body, introducing herself to Ulo; and then showed me how to use a technique to relax her legs. Remember that a horse very rarely lies down, and even sleeps standing up; so those legs are very important. I formed a sort of W with my two hands together and, starting at the top of her leg gently moved the skin a tiny bit upward with my hands, then moved a few inches lower to do this again, all the way down the leg. At first it was difficult, but then bringing my breathing into the mix, and moving the skin on an outward breath produced a noticeable relaxation in Ulo, she stood more square and lowered her head as she chilled out. We did other movements, Nicola showed me how to relax the strong rump muscles, the powerhouse all horses use to gallop, jump and even perform correct dressage movements. And then we went to her head, and that was where within minutes Nicola found the block I have seen over the years. Ulo holds tension in her jaw, and mouth. We have tried to reduce this tension in various ways; my daughter rides without a bit on the bridle, and often just on a neck rope; and I try to help her carry her head when I ride by helping her change neck position. Our excellent horse dentist gives her a shot before starting to work on her. We do our best, but who knows what trauma she has experienced before we became her owners. Nicola showed me a technique to relax her chin, and then gentle TTouch along her lips and around her mouth. Ulo did not tolerate this for long, but it was a start. It was a really interesting session; and also fantastic to finally meet Nicola, but perhaps the biggest result was the next day. I groomed Ulo and added a few TTouch movements around her head and mouth before I saddled up to ride. As we started it seemed as if Ulo was more relaxed; she definitely lowered her head and stretched her neck a long way as we warmed up and moved easily into the different training exercises I wanted to practice. It was a great ride: all I ever want from Ulo is to know that we are able to work in harmony, that she is as happy to work as I am. So thanks Nicola for showing me these techniques, and I wish you success in bringing the concept to your clients. I am definitely a convert.